Dachshund Dogs - 70" x 82"
Dachshund Dogs - 50" x 50"
Dachshund Dogs - 28" x 14"
You can now find the Dachshund Dogs pattern for sale here in my shop!!!!! AND...... This little email and photo made my week! Thank you so much for sharing your sweet Foxy quilt with us Jill!!!!!! You can now find the Hello Foxy pattern listed for half price for a limited time. No coupon code required! Rainbow Crocodiles 66" x 75"
Rainbow Crocodiles 38" x 44"
I went back to what I had most recently had success with, the Giraffes in a Row, and analyzed what was it that made this pattern appealing. The rainbow. So I applied that rainbow theme to a couple of already designed patterns and came up with the Rainbow Crocodiles and Rainbow Lovebirds remakes. Rainbow Love Birds 40" x 52"
Rainbow Love Birds 14" x 38"
This week you can find the Rainbow Crocodile pattern here in my shop listed for half price. No coupon code required! This week you can also find the Rainbow Love Birds pattern here in my shop listed for half price. No coupon code required! You may be familiar with the phrase, "A day late and a dollar short". Well around here things in my life have been not so scheduled, to put it mildly. And I noticed that for the past two weeks the Let's Bee Social post has been a day early. That means I should also be two dollars ahead!!! Yay!!! Today I want to thank you all for hanging in with me as I have transitioned from my old life to my new and improved one. It's taken time for me to feel right. And to feel creative again. I think creativity is born out of happiness. And then being creative causes a feeling of happiness. So it comes full circle. And I think I am finally back in the loop! I have been amazed by and greatly appreciate both your emotional support through messages and emails and financial support through pattern and quilt purchases. Without you guys.... I never would have made it. For reals my quilty peeps. You make me wanna cry. 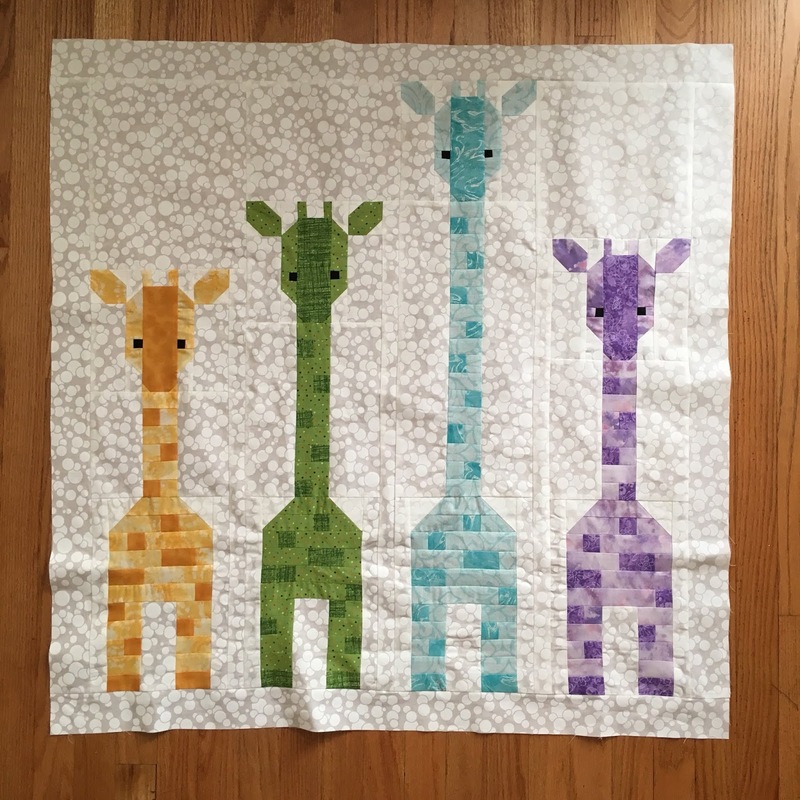 Today I am sharing this sweet little Giraffes in a Row quilt top made by Tina. She has an Etsy shop called 5LittleToes and makes personalized embroidered items for sale. Isn't this simply adorable? This week you can find the Giraffes in a Row pattern here in my shop. AND if you use GIRAFFES as the coupon code, you get 50% off!